A fairly new music and video streaming service, Apple Music has become popular with iPhone and Mac users alike, providing endless music whilst on the go. The concept was first established on the 8th June 2015 and was launched on June 30th to all Apple users. Customers that use Apple Music can select music to stream to their device on demand or they can choose an existing playlist that has been curated by Apple with specific songs in it such as the UK top 20. The service did originally begin as just music, being added to every iPhone users mobile when they updated their phone, but in 2016/17 it has been updated to now stream videos as well as music. The latest version of Apple Music is available in iOS 10 and includes several tabs including ‘library’, ‘playlists’, ‘Artists’ and ‘Albums’. There is also a search tab that enables you to find your music so that you can listen to a specific song without having to listen to an entire playlist. If you are an iPhone user, you will notice that the Apple Music app is automatically on your phone but to actually use the service (rather than just access your own original library) you will need to have signed up for a membership. 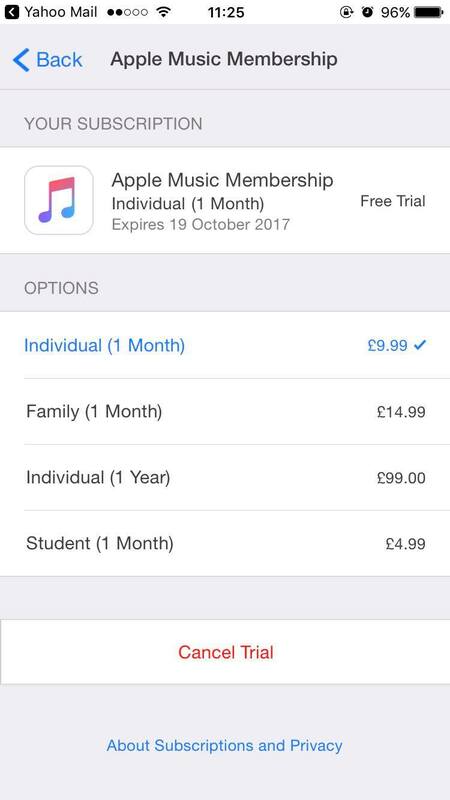 Apple Music is £9.99 a month for an individual membership, £14.99 a month for a family membership or just £4.99 for a student (you will need proof upon purchase). All of these memberships and accounts can be cancelled quickly and easily. Apple Music is a great service but you might feel that you don’t use it enough to pay £10 a month, you might find that you prefer other music and video streaming services or you might even be unhappy with the service you have received from Apple. Whatever the reason, following this guide will ensure that you can cancel your subscription hassle free, without having to pay any additional fees or charges. Please note that every Apple customer is entitled to a three-month free trial that will also need to be cancelled if you don’t want to continue with a paying membership. The first step to cancelling your account is by logging into your account via the Apple Music app or via iTunes. 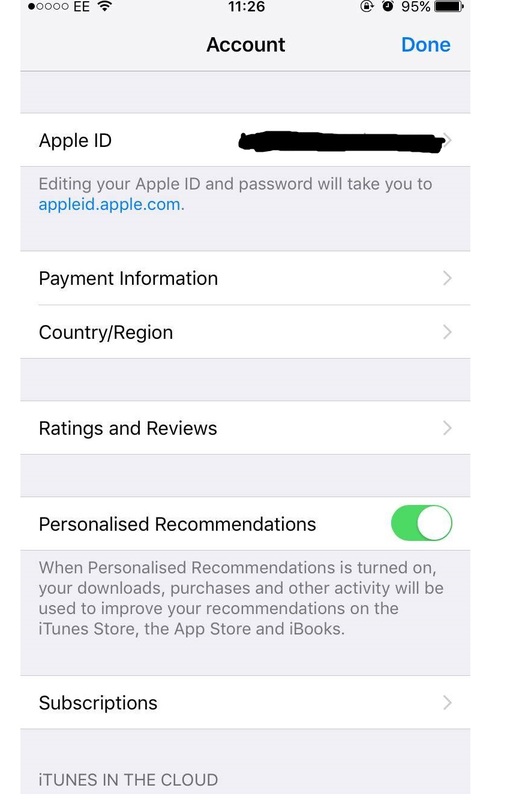 An Apple Music account can only be accessed via an Apple device so you will need to log in either on your phone, through iTunes on your computer or through an Apple MAC or iPad. If you have apple music on your iPhone then this is probably the easiest way to set about cancelling your account because you can do it through your settings. In this case, the person has signed up for an individual membership but they are still in the process of their three-month free trial. Once the trial has come to an end they will move over to an individual payment plan which will mean they will pay £9.99 per month. If you are on a free trial and do not wish to continue with your membership (perhaps it isn’t what you expected, or the overall payments are too expensive) then simply select ‘cancel trial’ at the bottom. If you want to know a little more about the subscriptions or the privacy policies then you can select the option below that and you will be redirected to a new page where this information will be explained. If you are not on a free trial but instead are just paying a membership then you will be able to cancel in the same way but select the ‘cancel subscription’ option instead. As you can see on the picture, the prices of each membership are displayed above. If you are on a monthly payment plan and decide to cancel your membership, you will simply stop paying your membership the following month. Most free trial subscriptions still require some sort of payment information before you have signed up to the trial and Apple Music isn’t much different. If you are already an iTunes user then your Apple Music will be linked through this, which means you will not have to re-renter your payment details, but if you are signing up for the first time your account number and sort code will be needed. If you are only intending on having a free trial of Apple Music and not becoming a full-time member then you may want to turn off the auto-renewal option which is automatically turned on. This way, you will not have to worry about Apple taking any money off you if you forget to cancel the free trial. If you have turned off auto-renewal, you can still continue with your Apple Music membership, you will just have to confirm that you wish to continue. Here is an example of how this is done. You can also see that at the top of the page you will be able to see how long is left of your trial. Simply swipe the button to the left to turn off your auto-renewal. There is also a way to cancel your subscription via a MAC or PC but you need to make sure you have the latest version of iTunes installed onto the desktop in order to do this. Once you have found iTunes, go to iTunes and sign in using your Apple ID or you can use touch ID if your MAC has the option available. Once you are logged in, click ‘account’ at the top of the screen and select to ‘view my account’. You will then be taken to the account settings page and you will see all of your subscriptions. To edit any of them, click the ‘manage’ option to the right. 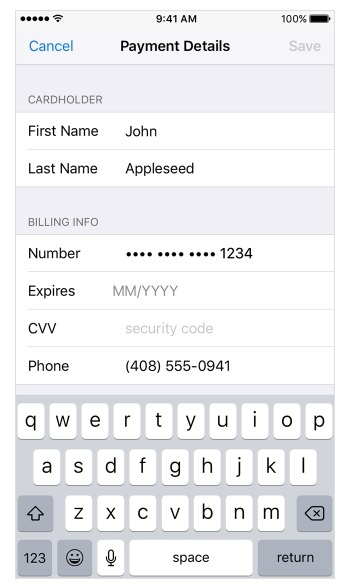 Please note that if you are not signed in with the correct Apple ID then the correct subscriptions will not be shown so make sure you are using the right ID. If you have a family membership you will need to log into the account of the person that set it up in the first place. If you want to cancel your subscription altogether, simply select the cancellation option at the bottom, but you can also switch to a new subscription if you think a different payment plan would suit you instead – for example switching over to a family membership or just paying a one-off payment for the year. (If you are a regular user then you will save money by doing it this way). In some cases, you may find that you are still being charged for a membership, yet when you check your subscriptions you cannot see any. If this is the case, it might be that your cancellation has not gone through properly. If you think that this might be happening to you, then you will need to contact Apple via their contact number rather than seeking help online as it will mean that the problem is looked into straight away. 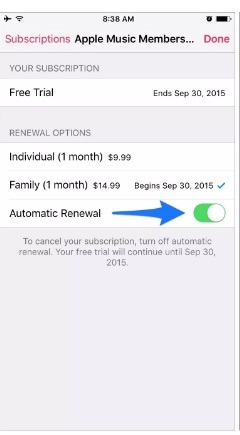 If you choose to cancel your subscription, your access to Apple Music will be cut off at your next bill date. So even if you cancel your subscription at the beginning of the payment cycle, you will still have access to Apple Music for the remainder of the period that the payment covers. If you are an Apple TV user, you will also be able to cancel your Apple Music subscription on your TV. If you are having any additional problems whilst cancelling your subscription then you can also contact ‘Apple Support’ which is an excellent online service that will aim to answer your questions and provide extra support to anyone that is having difficulties. If you have an Apple Music subscription, you are probably aware that there are different types of memberships that are available to Apple Music users. You may have signed up on a payment plan that you thought would be suited to you, but now wish to change that, which can also be done quickly and easily if you know how. With the cost displayed above, it is easy to note that with a monthly membership, you pay per month and with a yearly membership you sign up for 12 months but pay for the price of 10 – essentially getting two months free. This is a great deal if you are a regular user of Apple Music. Another great deal is the family membership which allows up to six family members to use the same account, paying just £14.99 a month. Each family member will get their own music library and you can also join on to an exisitng family membership as a new Apple Music user, if you wish. To change any membership, just like cancelling a subscription, the quickest and easiest way is to do it via the mobile app. Open the ‘for you’ section and tap on your user profile. Here you will be able to see what subscription you are signed up to as well as be able to explore the different options available to you. For example, if you are on a monthly payment plan but would like to upgrade to a yearly membership, simply select the individual ‘one year’ membership as your option, and your membership will automatically change. You will be sent an email confirming the change in your subscription and will then be able to arrange to adjust your payment details. If you would like to change your individual membership to join an existing family membership then you can also do this on the app. You will need to ask the organiser of the family group to go into their settings and invite you as a user to join the family group. After you have accepted the invitation, open the app, head back into the ‘for you’ category and check that you are able to ‘manage family memberships’. If you are, you have successfully been invited to join a family membership and your monthly fees will be reduced accordingly. If you do want to leave the family membership and restart your individual one, you can change back following the steps that are displayed on the Apple Music website. You can also alter your payment details via your PC or apple MAC – instructions for which can be found on the Apple website.